According to the ancient Chinese legend, only a mighty carp can climb the upstream of the Yellow River where water plunges a hundred feet, turning into a water fall. When it does happen, a carp can turn into a dragon and is able to ascend to heaven. Based on the legend, a task that seems almost impossible to attain is called ‘passing the Dragon Gate’. 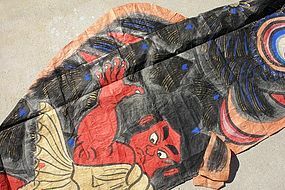 This story, as many other Chinese legends, was adopted by monks and scholars first in Japan, and then spread to the general population during the Edo period (1686-1868). (About koi-nobori) The Japanese warring period ended at the beginning of the 1600s when Ieyasu Tokugawa took control of the nation and became the first Tokugawa Edo shogun. The families of samurai started to decorate the outside of their homes with armor, spears and banners for a special occasion such as the birth of boys in the family. This custom began to spread to the general public around mid-Edo period (1603-1868). Without wars, the power of the samurai was rapidly declining while the merchant's was increasing with their strong financial power. Samurai’s goods and beautiful items, such as silk brocades, were not permitted for the general population (over 95 percent). Many sumptuary laws to punish the extravagance of the wealthy merchants were issued during this period. Cotton was too expensive for regular folks because they were not producing their own until the Meiji period (1868-1912). All Koi-nobori (carp banners) and streamers were made out of paper. Those impressive carps that we see in old woodblock prints did not survive to today. The oldest paper carp that I have seen (in a magazine) was made during the Meiji period (1868-1912). Many cloth koi-nobori were made from the late Meiji to Taisho. Cloth changed to nylon and hand-painted to prints in mid-Showa. Nylon koinobori has the advantage of flying in the sky because of its weight and durability. Today, there are still people who make hand-made koi-nobori (on cotton or washi paper), but the numbers of them are very few. Washi paper arts are precious. They even made some samurai's jacket out of washi paper.